(Ottawa, Ont.) Wheelchair Basketball Canada is delighted to announce that Jeff Dunbrack is joining the organization in the role of High Performance Director as of January 2017. Dunbrack will be responsible for the strategic direction of the Wheelchair Basketball Canada high performance program, including maximizing the potential of Canada’s national teams at the world championships and the Paralympic Games. Dunbrack will also work alongside Mike Frogley, who remains in his role as the lead coach of the National Academy program, to optimize the development of the next generation of elite Canadian wheelchair basketball athletes. Dunbrack will begin his tenure with Wheelchair Basketball Canada as of January 9, 2017. He returns to the organization after spending the last four years as a high performance manager with the Canadian Paralympic Committee. In his role with the CPC he managed the delivery and implementation of the high performance strategies and programs in key areas such as coaching, athlete classification, games preparation and planning, athlete identification, results and performance analysis. He attended the Sochi 2014 Paralympic Games and was a member of the CPC core leadership team at the Toronto 2015 Parapan American Games and the Rio 2016 Paralympic Games. “I am truly grateful for my time with the CPC and for the opportunity to have worked with such tremendous colleagues, athletes, coaches, sport partners and volunteers over the past four years,” said Dunbrack. 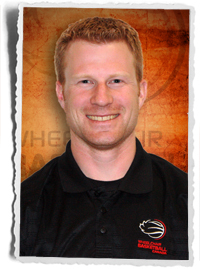 This appointment is Dunbrack’s second stint with the organization as he spent four years working with Wheelchair Basketball Canada from 2006-2010, including three years as the coordinator of the high performance program. He was also the team manager of Canada’s Paralympic silver medallist men’s wheelchair basketball team at Beijing 2008. He moved on in 2010 to become a lead coach with the national para-rowing team at Rowing Canada, where he led the national team to gold and silver medal performances at the world rowing championships and an appearance at the London 2012 Paralympic Games.